FedTech's custom manufacturing services include both laser cutting services and waterjet cutting services with reverse engineering capability, complete CAD/CAM capability, same day quotations and competitive pricing. FedTech's custom manufacturing services include both laser cutting services and waterjet cutting services with value engineering capability, complete CAD/CAM capability, same day quotations and competitive pricing. The difference between waterjet cutting and laser cutting lies primarily in thickness cutting ability, material choice, and accuracy required for different applications. With some of the largest equipment in the Midwest, FedTech has the capacity required for your waterjet or laser cutting needs. What are the main differences between waterjet cutting and laser cutting? Read below for information about each cutting process. Our ultra-high pressure waterjet cutting services include water compressed up to 60,000 psi as a precise and powerful cutting tool that causes no heat affected zones (HAZ) or material distortion. The jet streams generated are capable of cutting material ranging from .0005" thick to 12" thick. Waterjet cutting is most commonly used for cutting aluminum, thick carbon steel and stainless steel, copper, brass, titanium, plastic, and rubber. Abrasive waterjet cutting can pierce or drill holes as small as .030" in diameter (0.004" for water jet without abrasive). All of our waterjet machines are equipped with multiple cutting heads that dramatically enhance the effectiveness of cutting, making our process competitive over other comparable methods. FedTech also practices lean manufacturing. FedTech's waterjet cutting machinery was recently able to process a patterned series of small holes in a 4' x 8' sheet for a customer. The process could utilize three heads to cut production time by two-thirds. If the customer had used conventional methods, the number of holes would have caused constant drill breaking and increased production time. Using waterjet cutting allows for tight nesting of parts thus saving on material costs. Other benefits from this waterjet cutting application include cutting tolerances as close as +/- .003", burr-free parts, low contact force of the cutting stream, no heat affected zones, cutting of nearly all materials, no distortion or warping of materials, and a small kerf width to allow tight nesting and optimal material usage. Since waterjet cutting utilizes a high velocity, coherent stream of water and abrasive, it can be used to cut most materials. This includes: stainless steel, carbon steel, all tool steels, titanium, aluminum, brass, armor plate, wood, Kevlar, plastics, rubber, UHMW, phenolic, all foams, ceramics, marble, granite, glass, ceramic tile, copper and even Hastelloy. Tube cutting without affecting its inner diameter, and more. On the other hand, our laser cutting services are an efficient option for small to large quantities and irregularly shaped parts. Laser cutting eliminates costly tooling charges and provides a quick turnaround. This method of processing is mostly used for stainless steels or steel metals up to 5/8" thick. When your job calls for metal, custom laser cutting maximumizes uptime while minimizing costs. Laser cutting for your custom metal project may be a perfect fit for our shop. 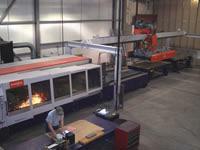 We have multiple large laser cutting machines on our production floor. The Bystronic Bystar 4020, has a production rate reaching speeds of 669 inches per minute. This laser-cutting machine provides faster turnaround from job order to shipping. Our Byspeed 3015, coupled with a 4400 Watt resonator, has speeds exceeding 250 inches per minute and a 120" x 60" work envelope. This laser cutting machinery features an automated loading system to enable quick turnaround on parts in production. To further ensure that turnaround rate, this machine features lights-out capability as well. This laser cutting cell is designed for laser cutting short to long run production. Along with this, we have the capability to process materials such as Hastelloy, stainless steel (SST), aluminum, and carbon steel. Customers often choose laser cutting for its cost effectiveness, cutting tolerances as close as +/-.003", repeatability +/-.001", and for its cutting capacity up to 3/4" carbon steel and 5/8" stainless steel. With the automatic dual pallet loading system and lights out capability, we can ensure quick turnaround on your custom application cutting. Contact FedTech today to request more information on our industrial laser cutting services or our waterjet cutting services, or to receive a custom quote! Contact us today to learn more about our customer-centered approach, and discover if laser cutting, water-only waterjet, or abrasive waterjet cutting is right for your job..